The Studies Division was established pursuant to the resolution No 33 of BADEA’s Board of Directors (December 1994); it began its activities in February 1995 with the objective of providing BADEA with the information needed to help in planning its activities and develop its programmes. The Division aims to inform BADEA about the evolution and status of economic development in Africa, investments flows for development of the continent, preparation of general and special studies, especially those related to BADEA’s activities, its policies, and supporting its objectives. Monitoring of global and developmental economic trends and identify factors that affect BADEA’s resources and operations. Provide information about the economic, social, development planning and sectors in the African countries eligible for BADEA’s assistance. Analysis of economic and financial structures of African countries and propose approaches to deal with these countries. Follow up on the activities of Arab and international development financial institutions and their contribution to financing development programmes in these countries. Establish working relations with research entities and coordination with other Arab institutions, and exchange of information so as to enrich BADEA’s research databases. Management of BADEA Library Unit ( BLU) by provision of books, references, and literature relevant to BADEA’s business for the interest of professional staff. Coordination, cooperation and participation with different departments of the Bank in the preparation of the Bank’s Annual Report and The Five Year Plans. 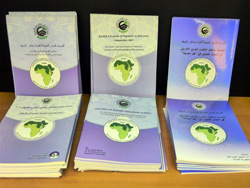 Preparation and implementation of BADEA’s of Research Programme in coordination with Arab and African economic development research organizations. Preparation and implementation of BADEA’s Research Prize Programme; this programme aims at providing research contribution in areas related to African economic development and Afro- Arab Cooperation.